I walked into a shop to buy a hat and asked the shopkeeper how her morning was. She said, "Ah, OK, still recovering from the storm." 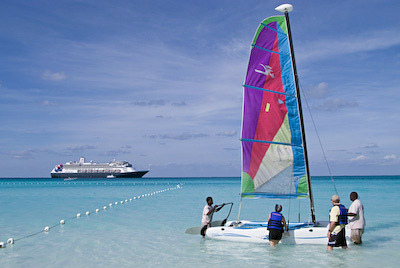 Our ship had missed the bad weather and we were enjoying a nice day on the beach. The locals weren't as lucky. I paid cash for the hat and wished her a speedy recovery at home. As I strolled the beach after my swim, I came upon this scene of a couple of tourists renting a little sailboat for the afternoon. I framed the shot with the Holland America ship in the distance to better tell the story of my first afternoon in the Caribbean. Photo by Derrick Story during the MacMania 7 Geek Cruise - Canon G9, Raw, ISO 80, 1/1250 at f-4.5, Auto White Balance. How long has it been since you've checked for updates for your printer? 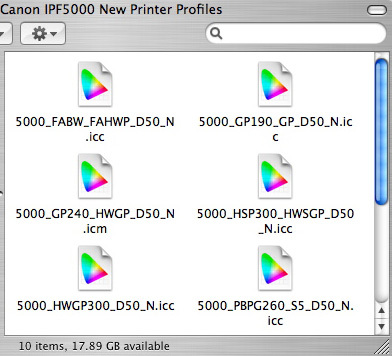 I've noticed that the major printer manufacturers (Epson, HP, Canon) have been doing a pretty good job of posting revisions for both firmware and new ICC profiles for paper. What fun! I just finished downloading a new firmware update for the Canon IPF5000, and even better, new printer profiles, created with X-Rite's ProfileMaker 5 for 10 different Canon papers. Chances are you're not using this printer, but my point is that new stuff is released all the time for older printers. And this becomes even more important if you're contemplating an OS upgrade (Vista or Leopard). Typically, one of the biggest frustrations after an OS upgrade is a printing glitch. So a little planning can potentially save you a lot of headache. "Photos shouldn't be trapped in your camera," say the creators of Eye-Fi, a wireless memory card that enables you to upload images from your camera to a computer or one of its online partners. This is most likely one of those stop-gap technologies, like the CD burner, that's useful until camera manufacturers get their wireless acts together and provide W-Fi as a standard feature. The good news is with the Eye-Fi, however, that even if your don't use its wireless capability, you still have a 2 GB memory card. Eye-Fi is for Jpeg shooters, but I suspect that if you shoot Raw+Jpeg, you can have your Raw plus wireless too. 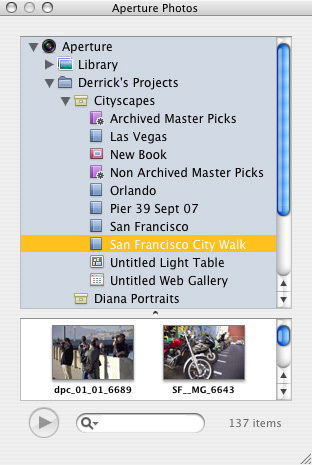 in addition to sending images to your Mac or PC, you can upload to Kodak Gallery, Wal Mart, Shutterfly, Snapfish, PhotoBucket, FaceBook, WebShots, Picasa, SmugMug, Flickr, Fotki, TypePad, Vox, DotPhoto, PhanFare, Sharpcast, and Gallery. The wireless range of the Eye-Fi is about 45 feet indoors, and twice that outside. It's compatible with 802.11g, 802.11b, and even 802.11n networks. It has decent security too: Static WEP 40/104/128, WPA-PSK, and WPA2-PSK. So you don't have time to visit a store for the latest offerings from Pentax? If you're in New York City, meet the BobCar. BobCars are three-wheeled, energy efficient, mini-vehicles that engage consumers right on the street. These mobile showrooms feature the latest Pentax digital SLR and compact digital cameras offering hands-on demonstrations, literature, and special incentives. 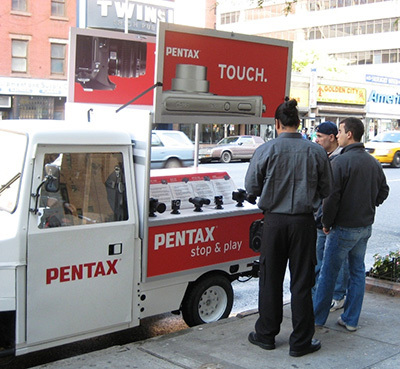 Two Pentax BobCars are scooting around a 15 mile radius in New York City from mid-October until the end of December. My experience with Pentax cameras has been positive over the years, especially with their DSLRs and water-resistant compacts. So I'm happy to see them trying something innovative to get the word out about their products. If you are hanging out in NYC at all between now and the New Year, here's the BobCar Schedule. Some of the best moments for me in New York City was spending time with Rick Sammon, who is passionate about teaching photography. His travels all over the world have enabled him to compile lots of great tips and tricks. He shares some of his favorites in an interview we had in the O'Reilly booth. 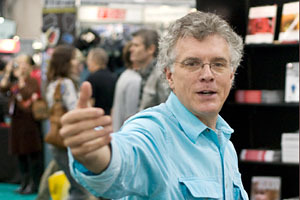 Photo of Rick Sammon by Colleen Wheeler captured with a Canon 10D, 50mm lens, ISO 800, 1/90th at f-2.5. One of the first visual tip-offs that indicate if a reviewer likes a camera is how the list of "pros" stacks up against the "cons." 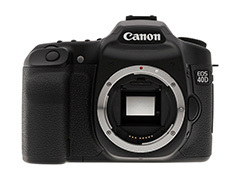 Two recent in-depth reviews of the Canon EOS 40D were published -- by Imaging Resource and by DP Review, and the pros and cons list were more lopsided than the first game of the World Series (Boston Red Sox 13, Colorado Rockies 1). DP Review's cons list, as short as it was, still seemed to be a stretch to find anything negative. In his conclusion, Phil Askey sums up: "When I first started using the EOS 40D a simple description came to mind: that this is a 'well sorted camera'. It feels well rounded - the result of years of evolutionary improvement, it delivers in almost every area, and it inspires confidence. From a usability point of view the viewfinder feels larger, ergonomics are good, the user interface is clear and easy to learn, there are no in-use performance issues, metering and auto-focus show good consistency and the results speak for themselves; colorful (yet accurate) detailed images with low noise even at high sensitivities." (From DP Review). Imaging Resource echos this sentiment: "The new Canon 40D offers a very mature set of features in a camera that's priced lower than its predecessors. It also offers as much value and image quality as competing designs that are hundreds of dollars more. Canon's pro SLR designs have always been conservative, and they didn't try to leap-frog the market with a higher resolution sensor; instead they stuck to a 10-megapixel sensor size that would deliver the quality that Canon fans are used to," says Shawn Barnett, Dave Etchells, and Siegfried Weidelich of Imaging Resource. These days, when I think DSLR, I want a camera that produces outstanding "photographic" images, that is durable, and is a pleasure to use. The Canon 40D fits that bill nicely. Yes, the reviews are in, and the the 40D is a hit. A comment I heard repeatedly touted the "quality" of PhotoPlus Expo in NYC. I have to agree. This event has become one of my favorite photography expos. As you walk the floor passing by Canon, Nikon, Epson, HP, Sony, Lowepro, Adobe, Apple, O'Reilly, Lynda.com, and on and on, you get a real sense of businesses that have their trade show act together. There's not a lot of junk or blaring noise. The booths are well-designed and professionally staffed. You can learn about new products at PhotoPlus and actually have conversations with staff about them. 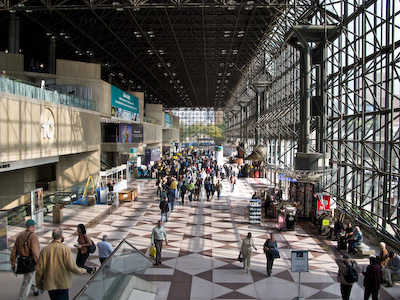 The Javits Convention Center, pictured here, contributes to this atomosphere. It is bright, airy, and supports lots of services including an excellent food court. And it's easy to navigate. The morning light is particularly beautiful as it streams in through the giant glass walls. In terms of announcements, the bulk of the activity was on the hardware side. New Lensbaby 3GPL, SanDisk 8GB Extreme III SDHC card, Sony PictureStation, Olympus lenses, Canon telephotos, Nikon wireless accessories, Epson Exhibition Firer Paper, and a new T-Max 400 BW film from Kodak, were just a few of the releases. However, software-wise, I did spend some time with DxO Labs and their new DxO Optics Pro application for Raw processing. I'll follow up with more information on that after testing. You can get a nice overview of the show announcements on the CameraTown PR page. The booth demos were also impressive. Apple was showing off Aperture, Adobe both Lightroom and Photoshop CS3, Nikon and their NX software -- just to cite a few big names. But every stop seemed to have something interesting to offer. PhotoPlus Expo might be an event you'll want add to your calendar for 2008. It's a great place to research products and get back in touch with the East Coast photography community. Smart people to talk to, lots to see and do.